We offer the sharpening image and clean Full hi-vision movie without haze or fog with FPGA implementation. ■Example of implementation of image processing to FPGA. 1. High-Speed processing by Hardware implementation. The image processing algorithm is implemented to hardware that enables the real time processing video stream with less power than software solution. 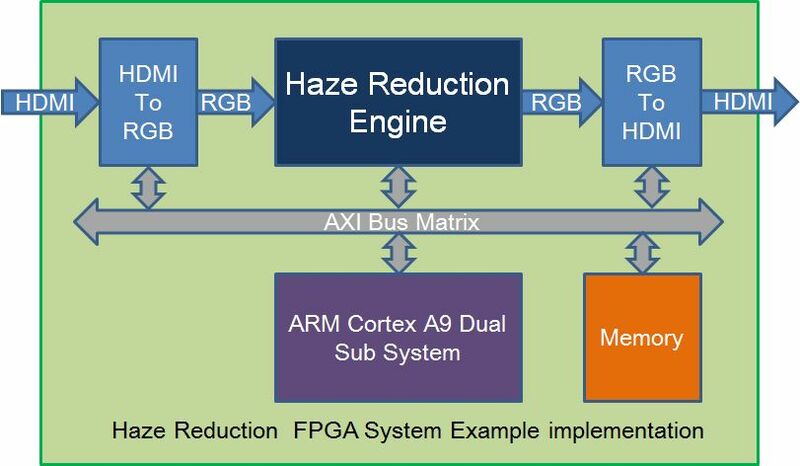 NSW provides Haze Reduction hardware IP for implementing FPGA device with generated binary format. Haze Reduction is processing video stream with scan line buffer that implemented itself, if customer needs the external frame memory then we provide using the external frame buffer version of Haze Reduction IP module. 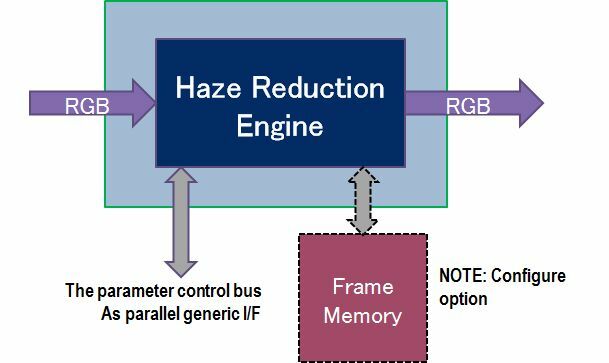 System Configuration Example that Haze Reduction process direct video input stream. There are two sample implementation of HDMI I/O for Xilinx FPGA and as DVI I/O for Altera FPGA. 2. Example of Haze Reduction in the network camera. It’s going to be the degraded quality image in the transmission compressed video, of course, although it’s possible to store the movie on the host system and remove the haze or fog with image processing. As this solution, you can get the less debased image with processing input signal as early as possible. It is suitable implementation by FPGA to process the big size movie as it is possible to implement to hardware. ※You need the bridge for your system BUS as BUS interface of RTL port is general-purpose BUS. Least line buffer or Frame buffer. ※You possible to optimize the structure of hardware in combination for application. - You should set down the target Device. - We supplies it as Library for implementation. Interface with C language or System C.
- Improving the visibility: reducing haze or fog. - Frontend and Backend camera of vehicles. Monitoring camera with improving visibility the sudden haze or fog. - Select the combination of processes for how blurry it is . We are ready to support the Demo and evaluation SW for kicking start about it. Please give us a call to the following contact.